Simple and delicious. This is one of my favorite dishes to have in my fridge. Good for breakfast lunch and dinner. Place all ingredients in a bowl and mix well. I use a bowl with a lid so that I can shake all the ingredients around so that they are evenly coated. Marinate for about 30 minutes to one hour. Store in refrigerator. Serve at room temperature. Enjoy!!!! Enjoy! and remember to Make It With Love!!! 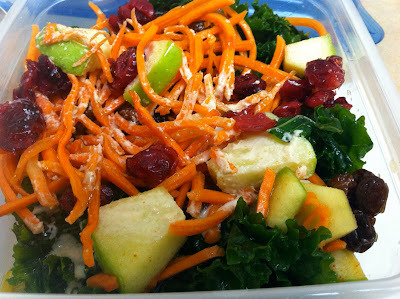 This is one of the first recipes that I created when I began my Raw Food journey. It's simple and delicous! Rinse and drain the kelp noodles. These noodles come pretty long so I cut them into smaller pieces. Put in bowl and add the remaining ingredients. Mix well. Let sit for about 30 minutes. And Enjoy!!! This dish can be enjoyed numerous ways. I usually put these noodles on my kale salad. And just last week I put some Gardein beefless tips on them...yummy!!! Enjoy...and remember to Make it With Love!